Note: As of November, 2017 we have discontinued weekly updates to this product. Contact us to request a current assessment or view monthly assessments below. 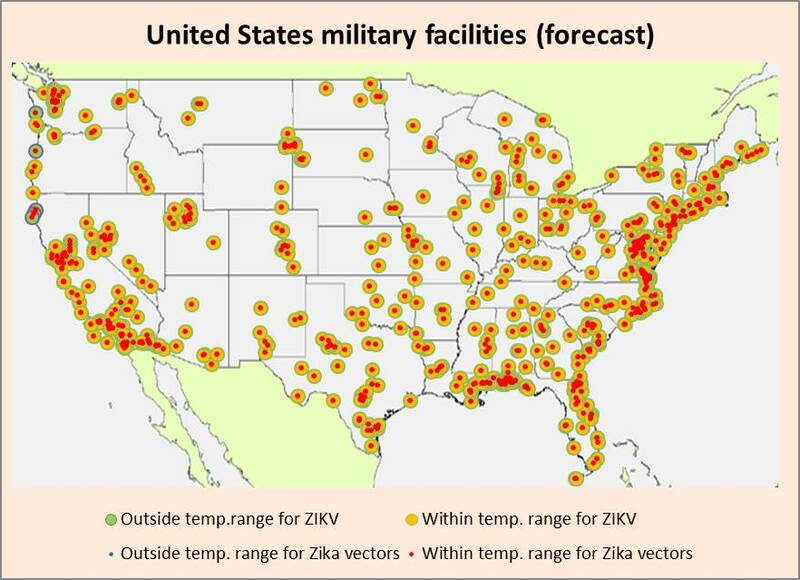 Click the following like to view the last near realtime and forecast Excel spreadsheet that maps and rates individual U.S. military facilities (CONUS, Alaska, Hawaii, Puerto Rico & Guam) by Zika risk factors such as modeled average Zika suitability, and recent temperature suitability and modeled average suitability for the vectors Aedes aegypti and Ae. albopictus. Spreadsheet also contains Action advice for each facility and potential human population impacted to enhance near term preparedness posture. 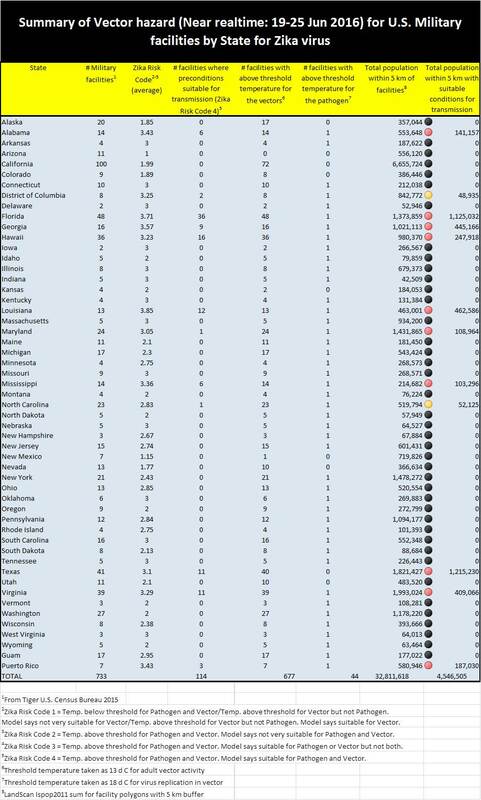 See maps and summary tables below for facility by state. Maps are updated weekly so make sure to refresh your browser as the cache may have stored an older version of the Excel file. 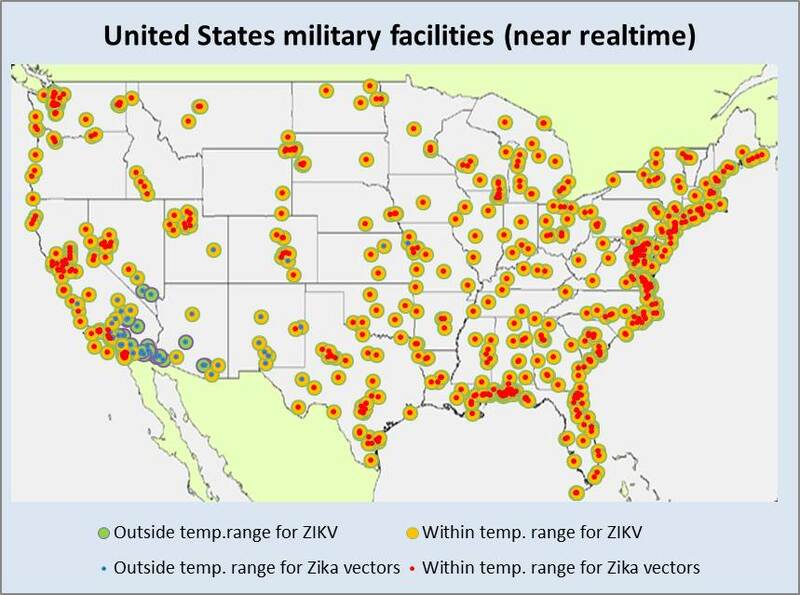 Click on a month link below to download an Excel spreadsheet that maps and rates U.S. military facilities according to whether average maximum temperature conditions for that month fall between thresholds 13 and 38 °C necessary for growth and activity of the vectors Aedes aegypti and Ae. albopictus, and between thresholds 18 and 42 °C estimated as necessary for replication of ZIKV in the mosquito. Spreadsheet also contains Action advice for each facility and human population in the area, to enhance longer term preparedness posture. 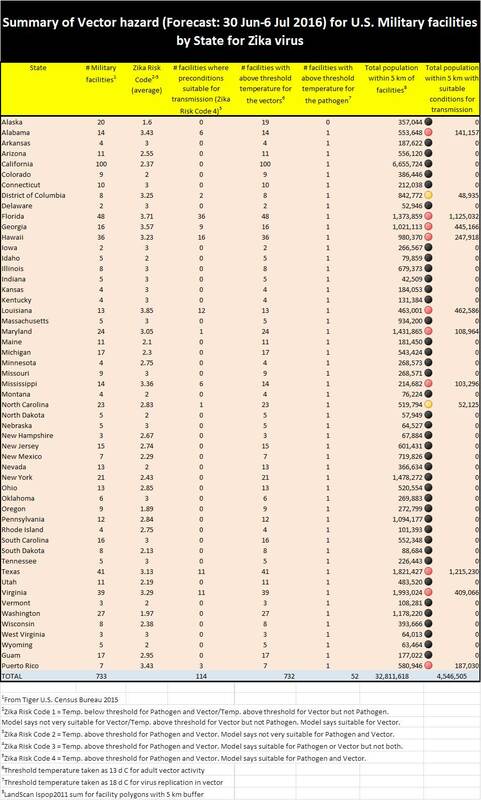 Figure to the left shows average yearly suitability (red more suitable, blue less suitable) for the presence of Ae. aegypti in the vicinity of White Sands Missile Range/Ft Bliss. The figures below represent the results of the last assessment in November, 2017.